Developed in 1982 at the University of Toronto, the glycemic index (GI) is a system for comparing carbohydrates based on their effect on blood glucose levels. When we eat, our bodies convert carbohydrates into a sugar called glucose. This sugar is the primary source of fuel the cells in our bodies. The glycemic index is a measure of how quickly carbohydrates break down and release glucose into the bloodstream. Foods with a high glycemic index contain carbohydrates that break down quickly resulting in a rapid rise in your blood glucose levels. Foods with a low glycemic index cause a more gradual and steady increase in blood glucose levels due to their slower carbohydrate conversion. Several studies have shown that eating a low-GI diet may have a beneficial effect on controlling post-breakfast hunger. Foods with a higher GI can result in hunger and sluggishness shortly after eating them. A low-GI diet also tends to steady insulin levels which could result in lowered risk for heart disease and diabetes. Fluctuating insulin levels associated with high -GI foods can weaken the body's cells and cause a condition called insulin resistance which leaves you more susceptible to disease. According to the Harvard School of Public Health, there is also evidence that low GI foods help people stay on healthy diets. 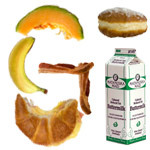 Here's a sampling of some common breakfast foods and their approximate rating on the glycemic index. *GI data for individual food items are composite figures from various sources and should be consider only as an approximation. While it's clear that the GI index can lead people toward healthier foods, there are problems with the system that should cause would-be low-GI dieters to think twice. The GI rating for a particular food can be greatly effected by the way a food is prepared or even chewed. For instance, a mashed banana has a significantly higher GI rating than a whole banana. Also, foods like candy and ice cream that are considered empty calories according to other nutritional guidelines fare well when applied to the GI rating. Another cause for concern is the speed at which the index has gained public interest. While many nutritionists and researchers are still out to lunch regarding the possible benefits of a low-GI diet, food manufacturers have quickly reacted to public interest and have begun promoting low-GI foods. Thus, consumers are currently getting most of their information about the index from manufactures and advertising firms. At this stage in the GI game, the index should be regarded as an additional source of dietary information to be considered along with caloric and fat intake. The best dietary tool we have is still good old common sense. If you have a donut and an orange, you can always find a diet that justifies eating the donut. You don't need a new index to tell you which is healthier. "Great Breakfasts" Start With The Letter "G"